As it says on the form, the $25 fee is included in the $160 application fee. It is not an additional fee. Further down, you can see that if you cancel your application or are refused, then only the $25 portion of the whole $160 is refundable. So, you want to pay $160. Not the answer you're looking for? 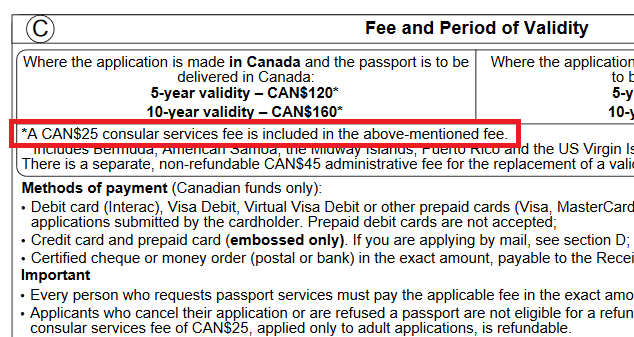 Browse other questions tagged passports canada fees-and-charges or ask your own question. What to fill in Schengen Visa Application 'Surname' field, if no Surname on Passport?